Another Indication Your Golf Season is Over! I am sure many of you have yearly golf traditions. 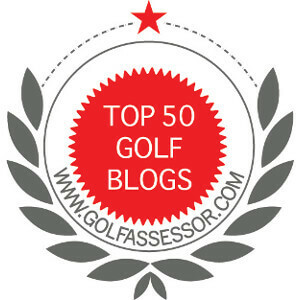 Recently, you read one of mine when I played my final round at Trillium Woods Golf Club. After my last round, my next tradition is to clean my golf ‘stuff’ and put them in a safe, warm place for the winter! First, I clean out all my pouches. There is nothing worse than finding a half eaten anything in your bag next spring. I take all my clothes and wash them. This generally includes my rain suit and other outer wear. I remove my towels and throw them in the wash. I generally carry two towels and replace at least one each year. This year, my beloved Nipissing University Towel will be recycled for greener pastures. I take all the broken ‘stuff’ and bin them. Then scour the sales to replace what needs replacing. This year I need to find a new pair of brown golf shoes. I wipe my bag clean. Lastly, I clean my clubs. I fill the basement sink with warm soapy water and let my irons soak for about 3 minutes. 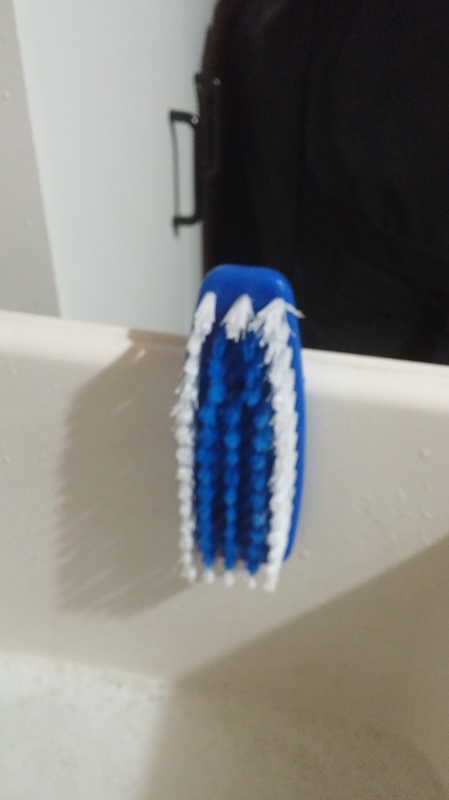 Then, I take a soft brush, scrub clean, and dry them off. Next, I dip my woods in the water for about 10 seconds, scrub clean, and dry off immediately. Lastly, I take a wet cloth and wipe off the grips and let air dry. This entire process takes about 30 minutes to an hour. 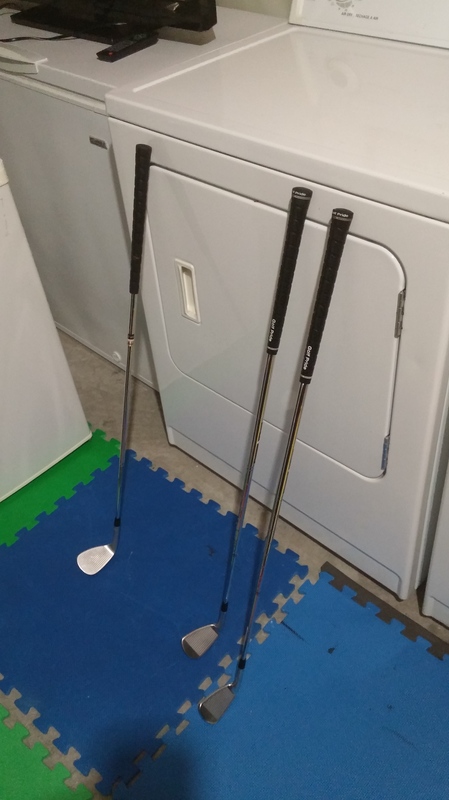 After air drying the grips, I place my clubs in my clean bag and anxiously wait for spring! Cleaning my clubs is an important yearly tradition. I believe that it is important to take care of my equipment. Most of us have a fair bit of money invested in our sport and this is one way of making my kit last longer. 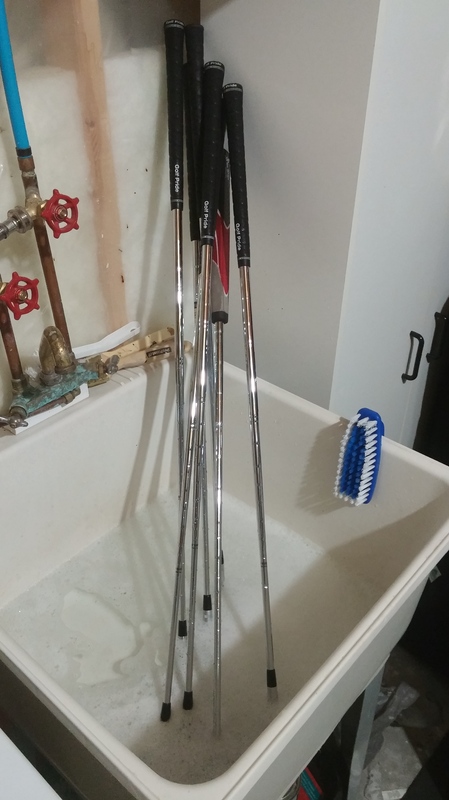 Do you clean your clubs at the end of each season? Do you have any other tips to make your equipment last? Hey Jim- yup, I also cleaned my clubs to officially signal farewell to the 2015 golf season as well. So very envious of everyone who get to play year round! I totally agree! But that is the nature of my golf season….a seven month sprint! Sounds like a plan. If nothing else your bag will be lighter. I find walking helps me stay focused in the moment. In the old days, walking helped zero in on my distances. My friends play 18 in 3 hours….good pace for us. As we play all year round I wash and clean my stuff on a regular basis. What I need at the moment is a new set of irons. I like my new titleist ap2 irons, but any top name clubs should work. Well I hope something will help, but I have a sneaking suspicion that old age is the culprit. That is a subject we do not discuss much. But it definitely could be a factor! Luckily this is not an issue for me. Would like to hear some tips for how you clean the outside of your golf bag. I just use soapy water. I gave an imitation leather bag. Works just fine. My nylon bag gets the hose. I do not think any chemical cleaner is good for my golf bag, so I do not use any. Me to! I have a change pouch, but it is normally empty. Once in a while I will put a couple of bucks in there, however there is never a pot of gold in it at the end of the season. Jim, I have a fairly similar routine but I’ll usually wait till around Christmas to put them away and with luck, take them out in late February when it starts to warm up. I also like to place an order for new grips and put them on over the winter. Sometimes I’ll change my driver, putter, and wedge grips mid season just to get that twice a year freshness feeling. Not this year, but I have found some unwelcomed leftovers through the years. I change my grips as well, but this year they are still new since I bought my new AP2s in August. Great to have back commenting.